The PUENTE Project Program is an academic, counseling and mentoring program of support for students to build the skills necessary for success in both academic and career goals at Imperial Valle College. Students enrolled in the PUENTE program work closely with their Counselor, English Instructor and Mentor to prepare for transfer to four-year university. Counseling Component - The PUENTE counselor provides academic, personal, and career counseling to prepare students to transfer to a four-year college or university. To help build the educational support network necessary for the students' success, the counselor also integrates the students' families into the program. The PUENTE counselor teaches a personal development (PD) class designed to enhance the students' college success. Relevant college and career success skills, information, and resources are available to assist each student in examining, planning, and setting her/his personal, academic, and career goals. English Component - PUENTE's writing component includes a developmental writing course (ENGL 110) in the first semester followed by a college transfer-level English composition course (ENGL 201). While adhering to the requirements of the course outlines of specific community college departments, the writing instructor moves generally from narrative or personal writing--in which students develop their voice and confidence--to writing based on rigorous academic prose, including analytical, argumentative, and research-based texts. Writing is presented as a process that develops in response to "real-life" audiences and peer groups. Students enroll with the same PUENTE instructor for classes over one academic year which creates a supportive environment for students through the curriculum. The courses integrate Latino and other multicultural literature in combination with skill-appropriate scaffolding for texts that build in rhetorical and thematic complexity. Students are also provided with an opportunity to use mentors and their communities as a resource for writing and to develop their relationships with their mentors. The courses offer an environment that provide students with the support and motivation likely to enable them to transfer. Mentoring Component - PUENTE is unique among college transfer programs by offering personal one-on-one mentoring by local professionals who graciously volunteer 15-18 hours during the academic year. 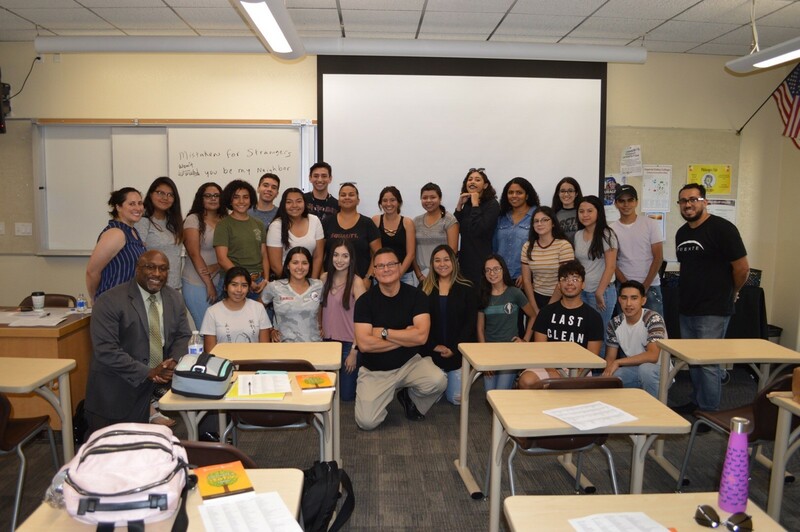 Our PUENTE mentors support the PUENTE counselor and English instructor by motivating PUENTE students to build the social and cultural capital they will need for their future success as college students and career professionals. All PUENTE Mentors are trained to follow mentoring guidelines and serve as successful career role models to their student mentees. Our experience shows that mentoring is inspiring to BOTH mentors and their Puente student mentee. Currently recruiting for the 2019-2020 Cohort, make an appointment with Jovan Rodriguez in the counseling office (760) 355-6543 for more information. Are eligible to enroll in English 110 for the fall semester. Have not completed Counseling 100 & Counseling 120. Are able to commit to program requirements. Are able to be full time students (enrolled in 12 units or more).